Begining that downward spiral . . .
(04-04-2019 06:34 PM)Hernando Hills Tiger Wrote: So after reading this thread I decided to call in a 6 pack to go at Coleman's here in Hernando. Some kinda good, frankly. So there are still Coleman's around? The ones I grew up on - Pickwick, Adamsville, Selmer, Jackson - are all closed. Hernando, MS on the main drag. 2000 feet from i55. (04-03-2019 09:43 PM)Hernando Hills Tiger Wrote: Bozo's close? They used to be the best. Tops was supposed to move into Lakeland where the old Mickey D's was located, but the f'd up politics forced them to reconsider. My source says Tops is looking at a new free standing building in the new Kroger shopping center in Arlington. This is not unique to Topps . Lakeland is about as unfriendly to business as anyplace around here, MUCH worse than Germantown. Germantown will basically tell a business they are not wanted up front. - Lakeland will want a new business then put up so many restrictions - often changing from meeting to meeting - that the business owner will decide to locate elsewhere. Sounds like Hernando. Every new business must be brick and the signs must be ground level. Before we got a Waffle House I had the guy trying to open one say it was gonna cost him an extra 50 grand to build it to their code. Cracker Barrel wanted to build in Hernando next to 55 and were told they couldn't put up the tall sign next to the interstate, so they backed out. I actually like the strict restrictions to keep it from turning into another Horn Lake/Southaven. But it's kind of getting out of hand with the traffic and lack of roads and businesses to handle the population. (04-08-2019 01:01 PM)3601 Wrote: Best beans I ever had were at Gridley's. I really like the sauce at Tops. Many of the places in town have sauce that is too sweet. Gridley's was the best BBQ restaurant ever in the Memphis area. You're right about their beans. NASCAR guy was right about Blue Plate used as a base for the Sauce. But that's been done here for years on end. The difference is some do it better than others. 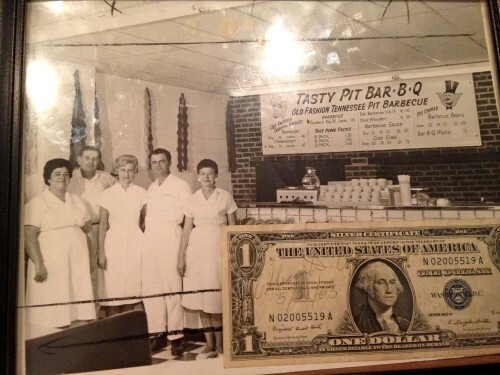 That Coleman's BBQ that Hernando was referring to has been there since 1971. The work of A.B. 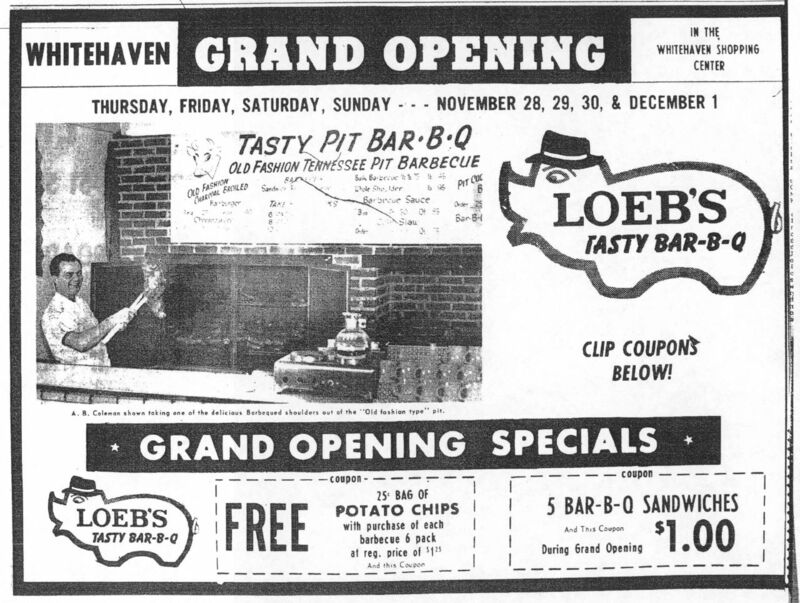 Coleman – first with Loeb’s BBQ and then with his namesake barbecue chain. Before those ventures, Coleman had brief stints with Tops and Little Pigs of America and then opened his own Tasty Pit Bar-B-Q shops. The first was on Winchester, the second at 698 Waring, This picture, framed along with a dollar bill, notes the beginning of Coleman’s association with Loeb’s. Coleman is second from the right, and his wife is third from the right. The dollar bill is signed by William Loeb and dated May 21, 1963, probably to celebrate their business collaboration. So Hernando is the original Colemans? What was Mrs Colemans first name? Mae Coleman. Played golf in a scramble with her. I think she still owns it. The one I miss most is Little Pigs on Highland. Went there at least once a week while I was at MSU. stopped by the sycamore view location today to buy a gallon of cole slaw for an easter bbq. even used a coupon with the purchase.